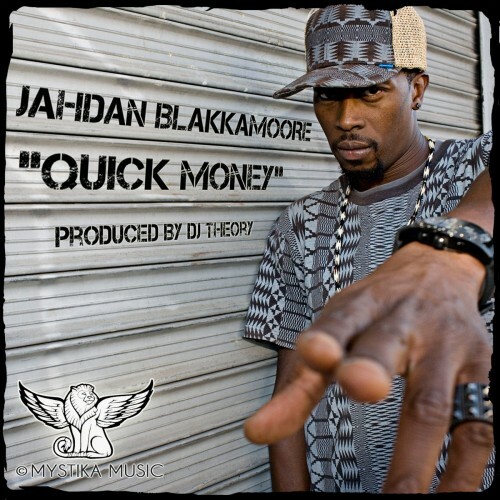 Mystika Music is proud to present "Quick Money", the groundbreaking new single from Brooklyn-based reggae/hip hop/electronic artist Jahdan Blakkamoore. With razor sharp production from Mystika's own DJ Theory, this is a highly-anticipated release that draws from many global influences and is set to impact listeners, DJ's, radio, clubs, tastemakers, and lovers of music worldwide. Jahdan was born in Guyana but moved to Brooklyn when he was young. He became quickly immersed in all the music that city had to offer. As he matured, hip-hop heads came to know him from his lyrical collaborations with DJ Premier, Afu Ra, Boot Camp Click and Dead Prez. Reggae and Roots fans began to know him from his band, Noble Society, collaborations with Lutan Fyah, Lee ‘Scratch’ Perry and Norris Man, or his recent collaboration with Diplo and Switch on their massive Major Lazer project. Bay Area resident and New England native DJ Theory has been hard at work in the studio and the club, steadily pushing the boundaries of popular and underground music to the world. As producer/DJ for MA-based hip hop group The Problemaddicts, official scratch DJ for the SF 49ers, founder and co-owner of the Mystika Music label, original music producer/remixer and full-time club DJ, you can expect to see plenty more from Theory in 2011 and beyond. Download your copy here.